Dalmatians are beautiful, intelligent dogs with either black or liver spots. They are normally a robust, healthy breed and many live for 12 to 15 years. Their distinctive character and appearance is an instant appeal but they are a strong powerful dog in both mind and body. Ideal heights of 22-23 inches (females) and 23-24 inches (males) at their shoulders, with typical weights of 25kg plus make them a large dog to handle. The Dalmatian is an active, energetic and creative dog that needs a lot of exercise and loves to play. They were bred to run for hours alongside a horse or carriage, and have almost endless stamina. Their strength and drive means they tend to pull on the lead without consistent training. Dalmatians are very people-oriented, they thrive on human companionship and should not be left alone for more than 2-3 hours. They are a loving and loyal companion however will suffer from separation anxiety if left for too long and will destroy your house in a panic. Dalmatians are wonderful family dogs, great with children however young children may find them too boisterous in their play. They are great in multi-pet households and can get along well with cats if introduced appropriately. This cunning creature who demands (and gets) your love is also an accomplished thief who steals food at every opportunity. Their main hobby is kitchen counter surfing and will take great pleasure in sampling your recently cooked meal left cooling on the side. This elegant dog who turns heads in the street, is not house proud! It is a good idea to move precious ornaments out of tail wagging reach as one lash from their strong constantly wagging tail and your family heirlooms will be for the dustbin or your cup of tea on the coffee table on the carpet. Their short coat is constantly shedding hairs, with no respect for what you are wearing and you will find white hairs all over your black trousers! A powerful vacuum is a must! Dalmatians are not suited to living outside. Their short coat gives little protection from the cold. They are much happier indoors for comfort and for the companionship of their family. They like nothing better than a good walk and then to lie in front of the fire! Dalmatians can be born deaf in one (unilateral) or both (bilateral) ears. This is usually detected at the age of six weeks by a BAER test. 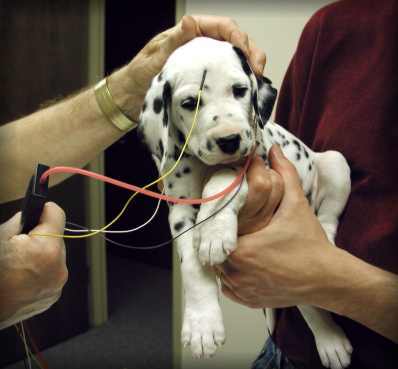 Dalmatian puppy being BAER hearing tested.